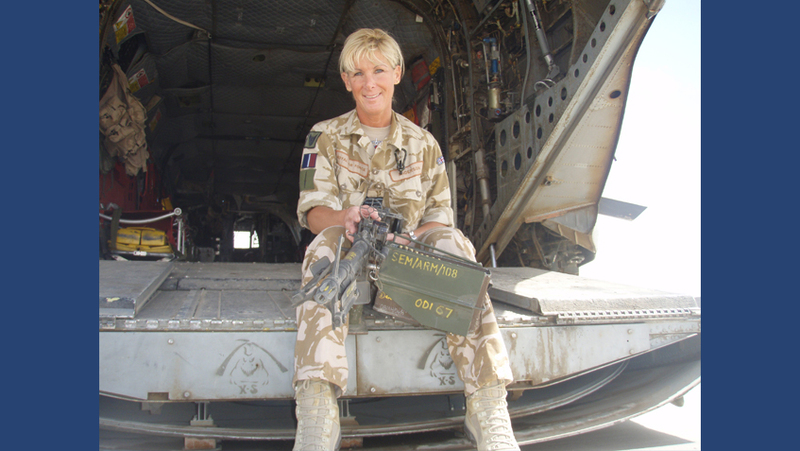 Shortly after the excitement of joining the PMRAFN and completing her RAF officer training, Heather faced the first of many challenging experiences while deployed abroad. While working as a midwife in Cyprus, Heather was involved in a serious accident when the ambulance that she and a five-day-old baby were travelling in blew a tyre and overturned.While hanging upside down, Heather realised that the baby was missing. In fact, the infant had been thrown from the ambulance and across several lanes of the motorway. Miraculously, Heather was able to resuscitate the baby and was nominated for the Sir Andrew Humphrey Memorial Medal, but the memory of the accident never left her. Over the next few years, Heather saw frontline action in Iraq where she worked as part of an IRT, an Incident Response Team, which delivered emergency medical aid to wounded soldiers. Similarly, she worked in Afghanistan as part of a MERT, or Medical Emergency Response Team, delivering the same, much-needed medical support. During these deployments, Heather responded to a number of traumatic incidents, including the mortaring of an Afghan compound in which dozens of children were injured. But there was no time for reflection. In this fast-paced environment, Heather had to keep up with the heavy demands and constant pressures. It was only when Heather left the Armed Forces in 2016 that she began to experience the symptoms of PTSD. She also began to question the medical decisions that she had made during her military career, even though her colleagues agreed that she had done the right things at the right time. Consumed by stress and anxiety, Heather’s mental health began to rapidly deteriorate. As the PTSD symptoms intensified, Heather was forced to admit to her civilian colleagues exactly what was going on. They referred her to the occupational mental health team who, Heather admits, were less than helpful. With no understanding of military service, they failed to grasp the pressures that Heather had faced. Even worse, having to describe in detail the events she had witnessed and having to justify her medical decisions only caused further distress and anxiety. Eventually, Heather found the right people to help her. After searching Google, she came across PTSD Resolution and was matched to a local therapist the day after making contact. After talking with Heather, the PTSD Resolution therapist explained that her reactions were completely normal and that trauma affects the mind in a cumulative manner. Just like a bathtub, trauma can build and build until it overflows and becomes unmanageable. When she heard this, Heather felt a wave of relief sweep over her. For the first time, she realised that these symptoms were a completely normal response to the events she had experienced and that, more importantly, it was possible to make a full recovery. Over the next few weeks, Heather continued to see her therapist and completed the Rewind Technique. Heather recalls that it was a mutual decision to end her treatment. She had really turned a corner and was now equipped with the necessary tools and knowledge to get her life back on track. The treatment that Heather received from PTSD Resolution was free of charge, just as it is for all veterans. However, Heather felt so much gratitude to the charity that she knew she had to give something back. First, she completed a charity bike ride, raising £1000, before speaking in praise of PTSD Resolution and their work in the House of Lords. First Published in Live 24 Seven. PTSD Resolution is incredibly grateful to Heather for sharing her story and for her fundraising and awareness work. PTSD Resolution could not continue to offer this much-needed service without the help of public donations. If you would like to make a donation to help more veterans like Heather, please head to our JustGiving page: www.justgiving.com/ptsdresolution.